Congratulations on coding your first project in CS First Fashion. 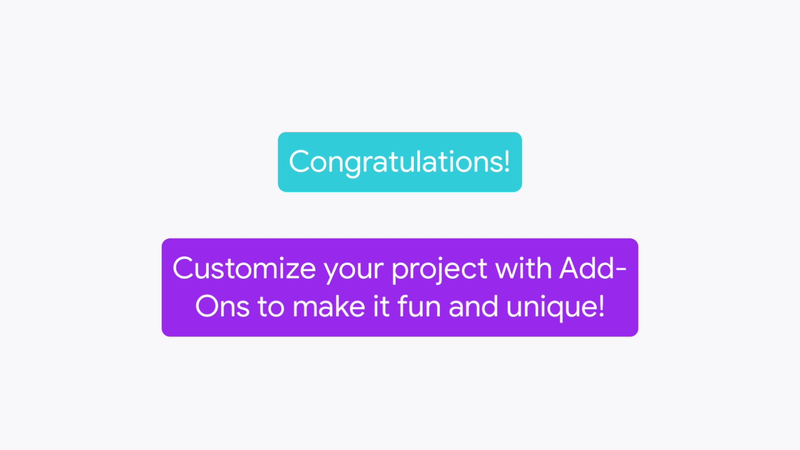 Now you get the chance to customize your project with add-ons. Scroll down the screen to discover the different add-ons you can try to make your project more fun and unique. In Appearing Objects, program the fashion object to glide onto the stage using broadcast. In Bubble Expressions, give the sprite personality by expressing its emotions with bubble emoticons. In Color Craze, make your program more visually exciting by changing colors. You can even add music. These add-ons are just some ideas for how you might customize your project. You can do one or all of them, and you can do them in any order. Feel free to brainstorm your own add-on ideas.